Greasemonkey is an extension for Firefox which lets you run bits of code, known as "userscripts", on any webpage in order to change the appearance or behavior of that webpage. Although that may sounds a bit technical it is in fact a very useful and powerful extension that can be used to resolve all sorts of problems and annoyances with specific websites or enhance the usability of websites. Sometimes URLs are written in plain text (for example on forums), and you have to copy and paste them into the location bar. So how about making all URLs on a webpage clickable? No problem, just install the linkify script. If you have a Google AdSense account, it's forbidden to click on your own ads so wouldn't it be nice to prevent yourself and other people that use your computer from accidentally clicking on your own ads? See: AdSense Click Protection (read the details). There is a fair chance somebody else has already written a userscript to solve your problem, try to search for it on Userscripts.org. And finally it's always possible to write your own (or ask someone else to write one for you). It's easy to activate or deactivate Greasemonkey by simply clicking on the monkey face at the bottom of your browser. However you can also just activate or deactivate individual userscripts through the menu that appears when you "left-click" on the monkey face. 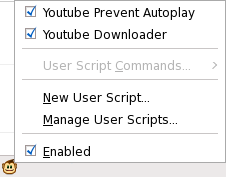 The menu will show the userscripts that are active on a particular site (YouTube in this example). Greasespot - Official Greasemonkey homepage and blog. Greasemonkey Wiki - Learn more about Greasemonkey. Userscripts.org - Search the repository of Greasemonkey scripts.